WWF Tanzania Country Office has launched and handed over an energy efficient Solar Kiln to eleven villages in Kilwa District Council. WWF Tanzania Country Office has launched and handed over an energy efficient Solar Kiln to eleven villages in Kilwa District Council. Speaking at the launch, Dr Amani Ngusaru ,WWF Country Director, stated that the support was part of the broader WWF's commitment to promote Participatory Forest Management (PFM) initiative through Community Based Forest Management (CBFM) that seek to promote forest conservation and create opportunities for communities to benefit from managing forest reserves under their village land. 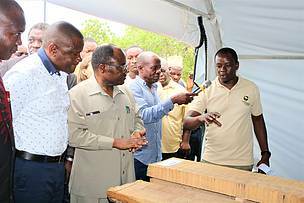 Narrating on history of the kiln, Dr.Amani said, “’Back in 2014 WWF together with our partner Mpingo Conservation and Development Initiative (MCDI) witnessed an increase in demand for high quality certified timber from the Southern parts of Tanzania. We saw this as an opportunity to us and to communities that own Village Land Forest Reserves as well as individuals in timber business’’. He continued, “In 2017 we found an Australian Company called Solar Kilns Pty specialized in construction of kilns that operates using solar energy. This was good news as we knew the use of renewable energy will have positive impact on our environment and makes the cost of running the kiln relatively low. The same year we purchased the kiln with generous support from WWF UK. August this year the kiln arrived and was installed at the plot provided by the Kilwa District. As of today the kilns’ total cost is 120/ml this include cost of purchasing, shipping, taxation and installation". Briefly speaking on the benefits of the kiln Dr Amani said ‘’ This kiln will bring many benefits to mention a few; increase the value of village timber, increase Local Government revenues, secure employment, promote sustainable forest management and certification. Furthermore the kiln will contribute to increase the income of communities by 68% thus encourage more communities to conserve their forests and join the certification scheme.’’ According to the MCDI, the solar kiln will address the demand for high quality certified dried timber, particularly from the private sector. And will be owned jointly by eleven villages from Nanjirinji ‘A’ and ‘B’, Mchakama, Kikole, Kisauji, Ngea, Kipindimbi, Namatewa, Nainokwe, Liwiti and Likawage. ‘’After securing the mobile sawmill used to cut timber many client started asking for dried timber. Therefore this solar kiln which has a carrying capacity of 20 cubic meter ,will enable villages to dry their timber without interruption hence increase the quality and price of timber in the market ‘’said Makala Jasper, Chief Executive Officer of the Mpingo Conservation & Development Initiative (MCDI). Giving his remarks at the event, Lindi Region Commissioner Hon.Godfrey Zambi said, Kilwa has been privileged to be the host of the Kiln. He challenged the villages and districts to make effective use of the kiln to bring socio-economic development. "I have seen how WWF‘s support is transforming lives of our people. I visited Nanjirinji Village, which is part of WWF Forest Programme and I was very impressed with how they are turning their forests in to opportunity for prosperity. I saw how they use their forest revenues to support improving health facilities, build schools, drill water wells the list is endless massive progress. Such successes are lessons to all of us that forest conservation is possible and tangible results can be derived from such efforts .I thank WWFs for their ongoing support to Lindi Region and call upon villages to be accountable in protecting their forests’’.